Deeside Writers host a workshop on novel writing with local crime writer Bill Kirton. Bill Kirton has lived in Aberdeen since 1968. He was a university lecturer in French but took early retirement to write. He's written and performed revues at the Edinburgh Festival, written, directed and acted in stage and radio plays and presented programmes on Grampian Television. 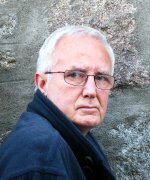 His crime novels, Material Evidence, Rough Justice and, most recently, The Darkness, are set in the fictional town of Cairnburgh near Aberdeen. Last summer, his historical novel, The Figurehead, set in Aberdeen in 1840, was published in paperback and as an ebook. Huntly Writers, Deeside Writers and Gordon Forum for the Arts for hosting the events. Scottish Book Trust for funding the series. Saskia Gibbon, Sheila Waterhouse and Marie Shaw of Aberdeenshire Council for continued support. John Glenday, George Gunn, Bill Kirton and Kenneth Steven.